Perhaps you’re wondering what’s the latest in regards to the Proposed Mountain Valley Pipeline and my involvement in the efforts to STOP the Pipeline. Whether you wanted to know or not, I’m writing to share some details. First, we enjoyed the Flatline the Pipeline Music and Arts Festival which was held at our farm early in June. (Photos here) Because of the success of the event, there is now one planned for Saturday, September 26th at Washington Park in Roanoke! Keep posted to the Flatline the Pipeline Facebook Community Page for band updates and vendor information. PLUS – there is an upcoming community meeting in downtown Roanoke – if you’ve wanted to learn more about the issues surrounding the proposed MVP, this is a great opportunity to get informed and meet others within the community who are concerned. Community Meeting information here. Secondly, I am now working part-time as a VA Community Organizer for the non-profit organization The Blue Ridge Environmental Defense League (aka BREDL). I began in early July and am enjoying the work – supporting communities and helping to further their efforts to protect the environment, especially with a current focus on stopping the proposed Mountain Valley Pipeline. 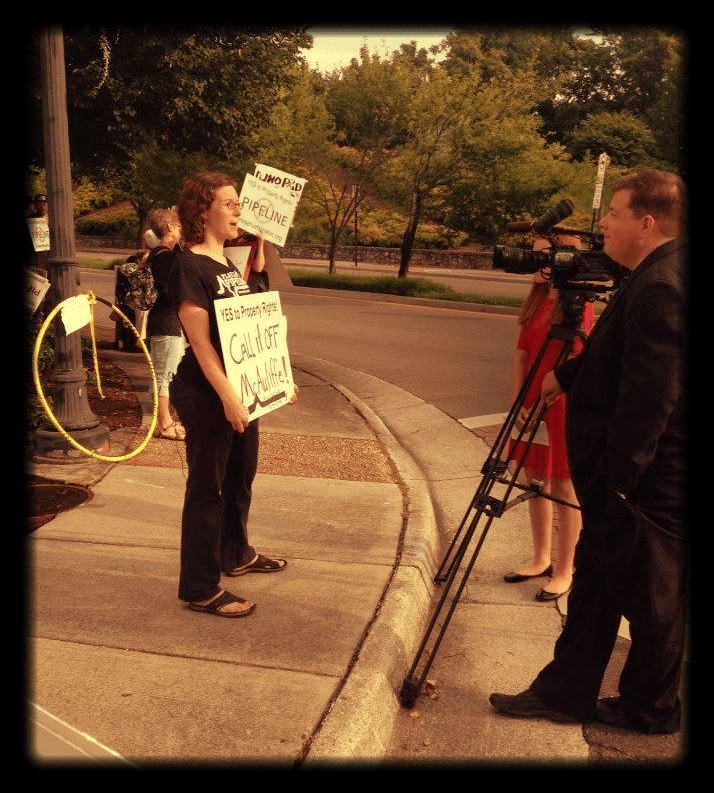 And lastly, there has been a variety of media coverage of our family’s involvement in the efforts to STOP the proposed pipeline (see Roanoke Times article here and a great write up on “Storypike” here) as well as other public efforts I’ve been a part of including this News Coverage (from photo above). The work has been time-consuming, but rewarding. Between the relationships formed with new folks and the connectedness that grows in a community, I feel humbled and blessed to be a voice crying out in the wilderness. I have been fighting pipelines for a long x. the XL was the hardest. Now with this a dead issue thanks to Pres. Obama the industry will shift to any and all pipelines they can. Greed $ is their issue. They do not care how they destroy the Earth to get it. I am Native American so I care about the Earth. We have been in this battle for ever. The east route is also from Cannada, down your way to s.c., Ga. and Fl. to the ocean. in our area it is called the Palmetto pipeline. It is a long fight. look up section 106 of NAGPRA. This can be used if just one dollar of Federal $ is used. fight the good fight. you are not alone. the xl was not stopped just by people alone, they had to follow Section 106. Our folks set up spiritual camps along the proposed area of the xl. many went to jail , especially those in Cannada the traditional peoples did not want the land destroyed,ancestral lands dug up and burrials and sacred sites disturbed. all this happens when the bullodozers arrive. Stay strong. As I allways close with this: “This is the only planet we have the HONOR to call home.”…thank you for what you and your family and friends are doing to protect this Earth……. We’re aware of the Palmetto Pipeline as well as the Sabal Trail Pipeline, and have been working with a BREDL chapter in Valdosta GA to fight for our rights and for the earth. It is so encouraging to hear voices like yours. Thank you for all you’re doing to honor and protect the earth! Everyone, keep up the good fight. The Earth really appreciates everyone who tries to make a dent in the greed oil/gas lines. They are like a spider web across this country that is still know as Turtle Island (now called the USA).If everyone pools what they know how to do, then the group can be that much stronger. Information is what the oil folks do not want the general public to know. Any & all meetings have to be announced(the Sunshine Law). Usually it is published in a local paper. Several meetings must take place. Then the next phase of any type of development goes to the zoning phase. Again more meetings for the public. All should be allowed to discuss. If people are against a development then draft letters. Have all sign that you can get. Phone representatives. They may not want to hear, but they were elected to a public office, so they should hear. People should meet and become very knowledgable about what is proposed in their area. It will effect them. Wear t -shirts that state your position to the meetings. in all things pray about your actions. The Earth is counting on you to be a very good steward of her. I hope this all helps in some small way. Know the battle will not be easy or quick. People you thought where your friends may not be so. People you do not know will be. stay safe. Some developers, when they feel threatened can cause harm. Just know your surroundings and prepare. It is a battle. Just because a company sounds like they have all the $ and power behind them, are nothing more that a company. People power. Reach out and touch all you can. Educate people of the issues. Stay strong. yours, Sharon. here are the people that make up this new group/ company, called Atlantic Coast Pipeline,LLC as of 9-18-15: Matthew R. Bley authorized rep.of Dominion Transmission,Inc and authorized rep for Atlantic Coast Pipeline.LLC. 701 E Cary Street Richmond,Va 23219,Pres Phillip C. Grisby of Duke Energy ACP,LLC,Thomas E. Skains Pres. of Piedmont ACP Company, LLC Pres Diane Leopold of Dominion Atlantic Caost Pipeline, and Ex Vice Pres. Henry P. Linginfelter of Maple Enterprise Holdings,.Inc. All this info from the abbreviated application to the Federal Energy Regulatory commission on 9-18-15. This is a new organization. If anyone wants to contact some of the parties involved: in their filings Exhibit C Pg 1 of 1 are the following: Charles Rawson (mgr) Ten Peachtree Place NE Atlanta, Ga 30309, Anne E Bomar (mgr & V.P.) 707 E, Main St. Richmond, Va 23219, Phillip C Grigsby (mr& v.p.) 550 Suth Tryon Street, Charlotte, NC 28202, Karl W Newlin (Mgr & v.p.) 4720 Piedmont Row Dr. Charlotte, NC 28210,Michcele L. Cardiff (chief acct. officer) 701 E Cary Street, Richmond, Va 23219,G.Scott Hetzer, (vp & treasure) 100 Tredegar Street, Richmond, Va23219,Henry P. Linginfelter (vp) Ten Peachtree Place NE, Atlanta, Ga30309, Carter M. Reid, (vp & Sect.) 100 Tredegar Street, Richmond, Va 23219, Karen W. Dogett (asst. Sect) 100 Tredegar Street, Richmond,Va 23219, john L Newman (Asst. tres.) 100 Tredegar Street, Richmond, Va23219. Dominion Atlantic Coat Pipeline, LLC owns 45%, Duke Energy ACP,LLC owns 40%,Peidmont ACP Company LLC owns 10%. the application being filed by Atlantic Coast Pipeline,LLC and Dominion Transmission(DTI) are also filing an application for the Supply Header Project with the Commission. per Exhibit E if the commission denies the Application,DTi would not proceed with the Supply Header Project and it would have a significant and adverse effect on this pipeline.this is the wording in the application of 9-18-15. Atlantic is also filing for a lease of Piedmont capacity. If this is also denied more adverse effect. In other words…..this is no done deal.The map shows the supposed pipeline going all over Va and through WSDA forest serv, areas, near rivers, streams, wildlife areas just to name a few. Many permits would be needed. Anything in the map on Federal land and under Federal ownership…..would set a precident. If this application is approved then every pipeline going through federal lands would be up for review……every Federal Native American Nation could petition for all to stop. They would have to comply.What a precident this would set.Talk about stopping piplines…..it sure would.This is still call a project. and this has not been approved yet. of course Duke, Piedmont,Va. Power Va Natural Ga, inc and Public Service company of N.c. would all like this application to be approved. A lott of money riding on this project. Even the Bureau of Land Management is involved. NOAA as well,National Park Service and of course the Army Corps of Engineers, US Fish and Wildlife, US Forest Service,Envrionmental ./. of several areas, Div. of Culture and HIstory…..Federal money….Section 106 applies.all this to say the Federaly Recgonized Native American Nations have to be contacted. MOU’s would have to be signed. this is on Pg 4 of 4 of the Exhibit J and not expected to be received before Feb. of 2016, aprox. The pipeline and all it’s moving parts have a lot of hurdles to overcome. hang in there…….keep alert………let folks know. Thanks again for your encouragement, inspiration and ideas!